In 1942, the completion of Grand Coulee Dam was hailed as the "Eighth Wonder of the World." Seventy years later, most of us aren't aware of what that dam or the others on the Columbia River continue to do for us. To commemorate Grand Coulee's completion, the Bonneville Power Administration commissioned legendary folk singer Woody Guthrie to write songs praising the dam that harnessed the mighty Columbia River. Guthrie toured the region from the Bonneville Dam to Grand Coulee, and within a month he had written 26 songs, the most famous of which is Roll On Columbia. "And on up the river is Grand Coulee Dam, the mightiest thing ever built by a man,to run these great factories and water the land, it's roll on, Columbia, roll on." 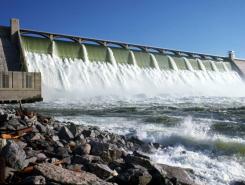 Recently, I drove most of Guthrie's route and saw eight of the 11 dams now operating on the Columbia in Washington. Most had their floodgates open, spilling water to move young salmon to the ocean. At Grand Coulee, flood control was the concern as operators dropped its massive reservoir to handle spring runoff from the mountains of Montana, Idaho and British Columbia. When I arrived home in Vancouver, the Columbia was at its high water mark as it often is this time of year, but it wasn't flooding. That's in stark contrast to the scene on May 30, 1948 when a levee on the flood-swollen Columbia River ruptured, sending a 10-foot high wall of water crashing into Vanport (North Portland). Sixteen people died and Vanport -- at the time, Oregon's second largest city -- disappeared forever. President Harry Truman flew west to see the devastation. Speaking to an audience in Portland, Truman said the flooding could have been averted if a network of dams along the Columbia, Snake and Willamette rivers was in place. He scolded Congress and told them to get off the dime and fund the Bureau of Reclamation to complete its flood control projects. Over the next 20 years, the McNary, The Dalles and John Day dams were completed on the lower Columbia and the Ice Harbor, Lower Monumental, Little Goose and Lower Granite dams were completed on the lower Snake, adding flood control capacity, creating a 465-mile water transportation network, and generating much-needed hydropower. One verse of Guthrie's song talks about the electricity generated by the dams as "turning our darkness to dawn." Washington's Columbia River dams produce enough power each year to provide electricity for nearly seven million homes. In fact, the Grand Coulee Dam is the largest producer of electricity in the United States. The electricity from those dams made it possible for the aluminum industry to locate in the Northwest and for Boeing to build B-17s and B-29s during World War II. Boeing became the world's premier aircraft manufacturer due largely to affordable and reliable electricity. Grand Coulee alone transformed 671,000 acres of desert into some of the world's most fertile farmlands. According to the federal Bureau of Reclamation, the Columbia River Basin Project produces $630 million worth of irrigated crops, $950 million in power production, $20 million in flood damage prevention, and $50 million in recreation income. For most of us, the dams have always been here. We never knew a time without them, when electricity was scarce, when we struggled to grow crops on barren land and lived in fear of raging floodwaters. But we shouldn't take them for granted. Some activists want to remove the dams -- but consider what our lives would be like without them. Don Brunell is the president of the Association of Washington Business.